Range of adjustable pitch aerofoil blade, cased axial flow fans designed for smoke extract in fire conditions and certified F400-120, F300-120 and F200-120 (CE marked). Casings formed from rolled sheet steel with a corrosion resistant hot dipped galvanised finish for all models. All models F400-120 except 2 poles incorporate separate high grade diecast aluminium blades locked within an aluminium injected hub (diameters from 400 to 630) or a pressed sheet steel hub. (diameters from 710 to 1250). F300-120 and F200-120 models incorporate an aluminium injected hub (diameters from 400 to 800) or a pressed sheet steel hub. (diameters from 900 to 1250). 2 POLES F400-120 model with aluminium impeller / hub formed from a one piece casting. All models are available in both short and long casing versions except 2 poles F400-120 model only supplied with long casing. Long casing versions (L) include an external terminal box. Suitable for horizontal or vertical mounting installation. - with three phase motors in 2, 4 or 6 poles. 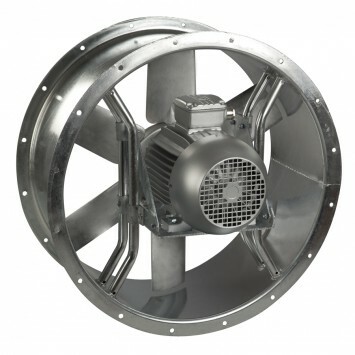 F400-120 motors are IP55, class H insulation. F300-120 motors are IP55, class H insulation. F200-120 motors are IP55, class F insulation. Three phase 230/400V-50Hz up to 3 kW. Motors suitable for inverter control. In emergeny operation, direct protected power supply. On demand: 4/6 poles 2-speed motors.